Wolfberry species (goji) currently grow in many world regions but only in China is there significant commercial cultivation. These berries have been used in traditional Chinese medicine for about 1,900 years to treat inflammatory conditions and some types of skin diseases. 68% of the mass of dried wolfberries exists as carbohydrate, 12% as protein, and 10% each as fiber and fat. 5 carotenoids, including beta-carotene and zeaxanthin (see content below), lutein, lycopene and cryptoxanthin numerous phenolic pigments (phenols) associated with antioxidant properties. The summary of the claims is that wolfberries strengthen the heart and alleviate heart palpitations, fight insomnia and forgetfulness, contain polysaccharides which control the pituitary glands that produce HGH (human growth hormone) which is a powerful anti-aging hormone, can be used by pregnant women to alleviate morning sickness, have in clinical trials shown a partial reversal in sexual dysfunction in seniors, boost the function of the immune system, have anti-cancer properties and have been successfully used to treat hepatitis-B, have been used successfully for weight loss, and help the body detox, clean the blood and build up the immune system. These statements are for the most part the marketing tools used to attract consumers based mostly on individual results of some people. Very little clinical research has been done to prove any of these statements. Pubmed.gov (national depository of all medical research worldwide) lists only 82 articles on goji as of December 2010. Glucopyranoside and phenolic compounds, isolated from wolfberry root bark, have shown inhibitory activity in vitro against human pathogenic bacteria and fungi. Wolfberries are the richest plant source of zeaxanthin , an important dietary carotenoid antioxidant of great benifit to the eyes. Human supplementation trials have shown that daily intake of wolfberries increased plasma levels of zeaxanthin. In addition to zeaxanthin, wolfberries are an excellent source of selenium and vitamin C both of which increase the levels of your body's master antioxidant Glutathione. However, when it comes to vitamin C for which wolfberries are so praised, its content is quite comparable to that of citrus fruits, strawberries and other fruits and vegetables which are much more common in North America than wolfberries. Several published studies, mostly from China, have reported possible medicinal benefits of wolfberries, specificaly potential benefits against cardiovascular and inflammatory diseases, vision-related diseases (such as age-related macular degeneration and glaucoma), having neuroprotective properties or as an anticancer and immunomodulatory agent. From our research we have found that some of these findings could be explained by wolberries being rich in carotenoids. In the west, however, none of this research has been scientifically verified, confirmed in clinical studies, or accepted by regulatory authorities. Two published case reports described elderly women who experienced increased bleeding after drinking wolfberry tea. Further in vitro testing revealed that the tea inhibited Warfarin metabolism (most widely prescribed anticoagulant drug in North America, also known under the brand names Coumadin, Jantoven, Marevan, Lawarin, and Waran). This provides evidence for possible interaction between Warfarin and undetermined wolfberry phytochemicals. No natural or pharmaceutical agent has been shown in clinical trials to fully prevent cancer, only to reduce its risk; there are no completed or ongoing clinical trials in the United States testing the effects of wolfberries or juice on cancer outcomes or any other disease and beyond preliminary laboratory studies and one Chinese clinical trial described only in an abstract, there is no scientific evidence for wolfberry phytochemicals or wolfberry juice having cancer-preventive properties. Studies did show though that plasma levels of zeaxanthin increased in healthy elderly subjects after 90 days of consumption of wolfberries, that general well-being, neurologic/psychologic performance and gastrointestinal functions improved in healthy adults over the course of 14 days, and that goji increased antioxidant activity in blood serum of healthy adults which suggests that continued use (beyond 30 days) might help prevent or reduce free radical-related conditions. 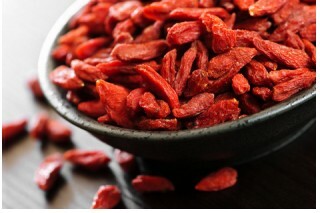 Read some of the goji berry research abstracts here. While not all of the sellers claims seem to bear out based on the studies found, wolfberries do appear to be a bioactive source of nutrients and antioxidants, specifically, zeaxanthin, selenium, vitamin C, vitamin B2 and zinc, that are beneficial to the immune system. More research is needed to prove that wolfberries prevent or cure any condition.